On 9th March 1946 Bolton Wanderers played Stoke City in a FA Cup tie. Over 80,000 people entered the Burnden Park ground before the club closed the gates. Some locked out fans decided to climb over the walls in order to see the game. Hundreds of spectators were pushed down a barrier-less section of the embankment under the weight of the crowd. A police officer walked onto the pitch towards the referee. He blew his whistle to stop the game and Nat Lofthouse saw the officer point towards the bodies lying motionless at the edge of the pitch saying: "I believe those people over there are dead." Thirty-three people died and over 400 were injured in the disaster. On the 9th March 1946, Stoke City travelled to Burnden Park the then home of Bolton Wanders for the second leg of an F.A. Cup 6th round tie. A huge crowd was expected that day and it's not difficult to understand why. Football in general was beginning to experience a massive upsurge in attendances due to the promise of better times ahead following the war years, added to which Bolton had surprisingly won the first match at the Victoria Ground and the promise of a semi final place beckoned. Despite the ground having reduced capacity, the game was not all ticket, as ticketed games where extremely unpopular at the time, and lastly was the promise that the Stoke team would include Stanley Matthews, a player of such renown it was said could add a minimum of 7, 000 to any attendance. Burnden Park, Bolton - a section of turnstiles was overrun by part of the unexpectedly large crowd of 85,000. The terracing became so over-crowded that the massed weight of the pushing, swaying fans caused barriers to collapse. In the horrific crush 33 people died and 400 were injured. Burnden Park was the scene of the Burnden Park Disaster. 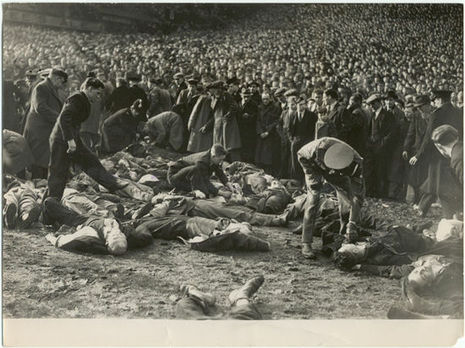 On 9 March, 1946, during a Football Association Challenge Cup (FA Cup) quarter-final second-leg tie between Bolton Wanderers and Stoke City, crowd congestion led to 33 Bolton Wanderers spectators losing their lives through compressive asphyxia and hundreds suffering injuries in a crowd estimated to be in excess of 85,000 people. The disaster happened at the Railway End of the ground where, in common with many other post-war grounds, facilities were rudimentary, The bank was crude, just dirt with odd flagstones for steps. The disaster led to the Moelwyn Hughes's official report, which recommended limitations on crowd sizes. A conference on the licensing and regulation of sports grounds where it was recommended that, as a voluntary, local authorities should inspect grounds with a capacity of 1 code 0,000 spectators and agreed safely limits should be in place for grounds of more than 25,000 capacity. Turnstyles should mechanically record spectator numbers and grounds should have internal telephone systems.